In Fiscal Year 2006–2007, the University of California and the California State University received approximately six billion dollars ($6,000,000,000) from the State General Fund, through more than 2,500 contracts or contract amendments from state agencies and departments. Prior to AB20 implementation, proposal requirements and contractual terms and conditions differed vastly depending on the state agency, university, university system, and/or the research relationships established by the principal investigator and program officer with state officials. The challenges confronting state agencies and university systems arose from inconsistencies in the language for proposal requirements, slow award processing times, and lengthy contract negotiations. Incomplete or ambiguous internal and external communications presented ongoing issues, along with frequency of revisions. University faculty and research administration staff routinely contended with the length of negotiations, with faculty especially hampered by budget inflexibilities. Proposal and award incongruities, missed project deadlines, and the lack of complete information could result in delays in project start times and report schedules and possible cancellation of proposals and projects. Although many of the contracts contained similar provisions, negotiations and drafting of acceptable terms could take from six months to a year. In many cases, the State bore the costs of both sides in contract negotiations. California Assembly Bill 20 (AB20) and California Education Code 67327 require the California Department of General Services (DGS) to negotiate model contract terms for use by state agencies that fund research, training, or public service projects conducted by campuses of the UC and CSU systems (Assembly Bill No. 20, 2009). On November 2, 2015, the three parties concluded negotiations and signed a Memorandum of Understanding (MOU) to enact collaborative, expedited proposal processes and agreement templates for new awards from State agencies issued after January 1, 2016 (University of California Office of the President [UCOP], 2016a; 2016b). The California Model Agreement (CMA) includes both pre-award and post-award models, thereby combining the state’s proposal and award processes. Submitted proposal documents make up the actual exhibits that are incorporated into the CMA, and the pre-negotiated model agreement provisions comprise the contractual terms and conditions (UTC-518) (University of California, Berkeley, 2017). The parties’ intention is to share full transparency regarding requirements and expectations, from proposal submission to award acceptance. In cases in which the UTC-518 terms and conditions are not adequate due to the needs and/or scope of the research, training, or public services, the CMA allows for a flexible approach to the model agreement in the form of an alternative terms and conditions exhibit (Exhibit G) (UCOP, 2016b; UCOP, 2017). Originally, the key stakeholders involved created a not-yet-adopted State and University Proposal & Administrative Manual (SUPAM) that provided details on completing each Model Agreement Exhibit during the proposal submission process as well as award and post-award information and procedures (UCOP, 2016a). The UC and CSU systems are two of the three segments of California higher education, the third being the California Community Colleges. The UC system was established as the focal point for academic and scientific research within the higher education system. In addition to bachelor’s and master’s degrees, the UC grants doctorates and professional degrees. The CSU system grants bachelor’s and master’s degrees that have a practical career orientation and is the largest four-year public university system in the United States (California State University, 2018). Creating the CMA required the collaboration of these two major multi-campus public university systems (10 UC campuses and 23 CSU campuses) and 168 State Agencies (State of California Agencies, 2017) to examine and significantly change their processes, adopt a new proposal and award business model, and translate that model to their staff and faculty. This article explores the university system view of the CMA at two different data points in the post-implementation process by applying two complementary research methodologies. Although there is a scarcity of research on this topic, the literature suggests that discussions for streamlining state research administration requirements began between 1986 and 1988 with the creation of the Florida Demonstration Project to develop and test new grants management procedures. The founding members included five major federal research and development agencies—the Department of Energy (DOE), National Science Foundation (NSF), National Institutes of Health (NIH), Office of Naval Research (ONR), and Department of Agriculture (USDA)—as well as the Florida State University System, and the University of Miami (Federal Demonstration Project [FDP], 2018). Eventually, the pilot project led to the implementation of the six-phased Federal Demonstration Partnership (FDP) project, a cooperative initiative designed to reduce the administrative burdens associated with research grants and contracts (FDP, 2018). Between 1990 and 1991, Phase II of the FDP’s Government-University-Industry Research Roundtable set up the State-Grantee Relations Task Group to prepare its Survey of State Requirements Applicable to Externally Funded Research Activities (FDP, 1990), which discussed state administrative requirements applied to university research (FDP, 1991). Gifford and Scanley (1991) explored the results of the survey and recognized that state and university research requirements were plagued by the same problems experienced between federal agencies and academic institutions: most notably, lack of budget and reporting flexibility, restrictive prior approvals requirements, and lack of pre-award costs mechanisms. Based on questionnaire results, the FDP Task Group was able to improve these research administration systems at the federal level. Future pilot demonstrations were considered at the state level to modify state requirements with grantee institutions for research proposal applications, standardizing grant terms and conditions, eliminating burdensome prior approvals, and creating uniform policies for reimbursement of indirect costs. Over 25 years after these FDP State-Grantee Relations Task Group discussions, the passing of California Assembly Bill 20 and implementation of the California Model Agreement have taken the model of streamlining state and university requirements from concept to completion in the state with the world’s fifth largest economy (Associated Press, 2018). This study arose out of a December 2, 2016 survey designed and initiated by the University of California Office of the President (UCOP) and California State University Office of the Chancellor to assess the first year of implementation of AB20. Its purpose was to identify nascent issues and challenges of the CMA and to facilitate discussions of its implementation at the first annual meeting of the University of California, California State University (CSU), and the California Department of General Services (UCOP, 2017). The survey instrument was targeted to approximately 85 individuals in the research administration community, including policymakers, directors, officers, and administrators. (The actual number of subjects who received the survey is indeterminate due to the varied group email dissemination process that was employed by the UCOP.) It was distributed to 10 University of California campuses, 23 California State University campuses, the University of California Office of the President, the California State University Office of the Chancellor, and the UC Division of Agriculture and Natural Resources. The survey included 5-point Likert-type scale questions regarding pre-AB20 implementation workshops; a series of agreement provision rankings with a drop-down menu of 22 pre-populated categories (including a separate option to enter “None”) that mirrored the 26 Articles of the CMA, along with accompanying fields for qualitative responses; and a series of “Yes” or “No” questions. The author secured written approval from both the UCOP Research Policy Office and the California State University’s Sponsored Programs Office at its Office of the Chancellor to obtain the raw survey data. Prior to data collection and analysis, it was necessary for the author to complete human research training and certification, apply for Exceptional Principal Investigator status through the UC Berkeley Office of the Vice Chancellor for Research, and submit a research protocol to the UC Berkeley Institutional Review Board. Although the UCOP survey had reached a wide audience, it was clear to the author that a second qualitative interview-based cohort would be needed to target specific areas that the initial survey had not covered. Concurrently, to meet relevant standards and protocols, the author obtained Collaborative Institutional Training Initiative (CITI Program) certification, Principal Investigator status (April 2017), and UC Berkeley IRB approval (CPHS Protocol #2017-05-9926). For the second cohort of the study, the author conducted 10 in-depth interviews among UC Berkeley staff and faculty. In the participant pool were supervisors, research administrators, and research faculty, including a principal investigator and a project director. Participants were selected based on their day-to-day administrative or technical experience with the AB20 CMA process. Additionally, only participants with prior research experience and a minimum of two years research experience at UC Berkeley were selected. Interviews lasted 20–30 minutes, with 80% of the interviews conducted in person and the remaining interviews by phone. Informed consent was obtained verbally for all participants. The second cohort’s interview data responses were transcribed by the author. Responses were assigned by words or phrases to coding categories, and textual data including ideas, concepts, and themes were coded to fit the categories and frequency of themes within the responses. Responses that did not appear in multiple interviews were noted accordingly, as were themes that were expressed multiple times during interviews. The author was constrained to a small sample size due to 1) the newness of the AB20 initiative and unfamiliarity with the AB20 CMA process by university staff and faculty, and 2) survey participants selected by the UCOP and the CSU Office of the Chancellor prior to the conception of this study. The author’s intention was to conduct a pilot study with both the available UC and CSU data and the in-depth interviews conducted at UC Berkeley. A larger sample size with the inclusion of a broader spectrum of state and university key stakeholders is recommended for a follow-up study. Descriptive statistics were derived from survey data collected by the UCOP. Frequencies and cross tabulations of the data were generated using Stata Version 12 and Microsoft Exceltm. Figures and tables were created using Microsoft Exceltm. Of the approximately 85 targeted subjects, 38% (N=33) completed the survey questions; 55% (N= 18) of respondents were from the CSU system and 45% (N= 15) were from the UC system. The UC responders comprised directors, grants and contracts officers, a manager, and a research analyst. The CSU responders comprised directors, grants and contracts officers, a manager, a vice president, and research analysts. Fifty-two percent of survey responders also participated in an AB20 Implementation Workshop. The workshop was initiated a few months prior to the inauguration of the CMA to inform staff at both the UC and CSU systems of the upcoming changes to the state proposal and award processes, to ease the transition among research administration staff, and to address any early concerns or uncertainties. Among these workshop participants, 47% (N=8) were from the CSU system and 53% (N=9) were from the UC system. The breakdown of participant statistics is presented in Table 1 below. Respondents were asked to select the top three provisions that they would like to see revised. Thirty-two percent of the respondents considered Payment & Invoicing as the top provision that needed revising. The predominant provisions considered for revisions (by rankings of 1, 2, or 3) are compared in Figure 1. Conversely, 42% (N=14) of the respondents reported that they would not change any of the provisions, with 61% (N=9) of the CSU respondents indicating no changes to the CMA provisions were necessary compared to 20% (N=3) of the respondents from the UC system. Along with provision revisions, the second focus of the UCOP AB20 CMA survey was to collect data on Exhibit G (Appendix 1). The California Education Code authorizes a flexible or modular alternative for projects in which one or more CMA terms are inappropriate or inadequate for a specific project. These alternative terms and conditions are known as “Exhibit G” under the CMA (UCOP, 2016; UCOP, 2017). Participants were asked which CMA terms and conditions were routinely changed via the Exhibit G vehicle. Twenty-three percent of responders stated that when receiving an agreement from the State of California with an Exhibit G (Negotiated Alternate UTC Terms), the terms and conditions were most likely to change the CMA terms and conditions significantly. Of those who indicated that changes would result, the most frequently chosen change was Payment & Invoicing (22%). 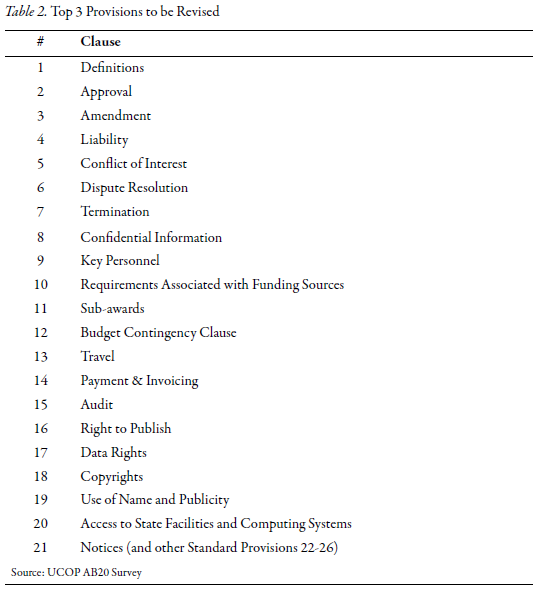 This was followed by Right to Publish, Liability, and Copyrights (at 8% each) (Table 3). 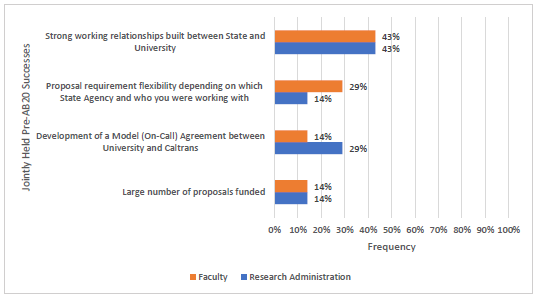 The AB20 CMA survey captured the UC and CSU systems’ attitudes towards the California Model Agreement nearly one year after implementation. As mandated by the AB20 act, the UC, CSU, and state must meet annually to discuss critical issues regarding the AB20 process and the California Model Agreement Terms and Conditions (UCOP, 2016). The campuses mostly concurred that revisions to the CMA were not a top priority at the 2017 meeting. However, they agreed that Payment & Invoicing terms (a concern of most survey respondents) would be a priority for the next iteration of the Model Agreement. The majority of negative responses to receiving non-favorable terms and conditions under Exhibit G points to a need to improve or clarify its function within the CMA, and remains a point of contention between the university systems and the state. The UCOP and CSU Office of the Chancellor continue to request input from various constituencies including state agencies and CSU/UC campuses via annual surveys to negotiate and make adjustments to the CMA terms and templates. Descriptive statistics were derived from human subject interview data collected, transcribed, and coded by the Investigator. Frequencies and figures were created using Microsoft Excel™. The three faculty participants included a principal investigator, a project director, and a program director. The average number of years of combined research experience was 14 years between 13 and 15 years of research experience). The average level of AB20 CMA knowledge (based on a scale of 1 to 10) was 6. The seven research administration interview respondents included three officers, two directors, a team leader, and a supervisor. The average of combined research administration experience was 12 years (between 2 and 27 years of research administration experience). The average level of AB20 CMA knowledge was 7. Large number of proposals funded (14%). It should be noted that one respondent stated that there were no pre-AB20 successes (not included in the percentages). Participants named inconsistent proposal and/or contract terms or requirements among the primary pre-AB20 challenges in their responses. Budget inflexibility, long negotiation and award time, and lack of internal and external communication followed as the top challenges (Figure 2). Educating the state on how the AB20 CMA process works was the main critical issue in post-AB20 CMA implementation responses as well as both post-AB20 CMA recommendations and post-AB20 CMA improvements responses. Other major critical issues were the lack of a standardized indirect cost rate and, for research administration respondents, the inclusion of Exhibit G allowing for alternate or modular CMA terms. Some respondents also mentioned the need to provide more education on how the AB20 CMA process works within the university setting. The author found interesting the differences when faculty and research administration members’ responses to the interview items were compared. The following section is a detailed comparison by item of how each group responded: what they had in common (jointly held responses) and what responses they had separately. Research administration staff responses to three of the open-ended questions were notably more varied than were faculty responses, as will be seen in Tables 4-7 for pre-AB20 challenges, critical post-AB20 issues, and AB20 improvements, respectively. Each interview comprised 7 multi-part questions (Appendix 2) and lasted approximately 20 to 30 minutes. As previously noted, all interviewees had prior research experience with a minimum number of two years of research experience at UC Berkeley. 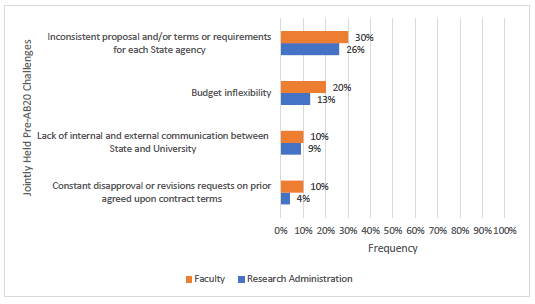 Inconsistent proposal and/or contract terms or requirements for each state agency were the predominant pre-AB20 challenge for both faculty and research administration, as displayed in Figure 2. This was followed by budget inflexibility, lack of internal and external communication between the state and the university, and constant disapproval of or revision requests on prior agreed-upon contract terms. Ten percent of faculty respondents deemed the constant disapproval of previously agreed-upon contract terms as problematic, compared to 4% of research administration. Budget inflexibility was also more of a concern for faculty, as were inconsistent proposal terms and communication issues. Faculty had additional concerns not held by research administration that included uncertainty of how adopting the model agreement would impact their research and uncertainty of what the AB20 CMA process for state contracting would look like. Research administration respondents identified a larger number of issues. Length of negotiation and award times was a concern of 13% of these respondents, as shown in Table 5. The majority of both respondent groups agreed that the leading pre-AB20 success was the development of strong working relationships created between the state and the university (Figure 3). Both respondent groups agreed in the same proportion on the large number of proposals successfully funded. More faculty expressed agreement with proposal requirement flexibility, whereas research administration were more responsive to the success held by an earlier pre-AB20 working version of the Model (On-Call) Agreement that was piloted between a single state agency (Caltrans) and UC (State of California Department of General Services, 2017). Neither group noted additional successes. Both groups agreed that the most critical post-AB20 issue was “educating the State agencies on how the AB20 CMA process works.” “Educating University staff and faculty” as well as “non-standardization of indirect cost rates” were also jointly held issues but not as prominent. Additionally, research administration respondents noted critical post-AB20 issues that were not shared by faculty. 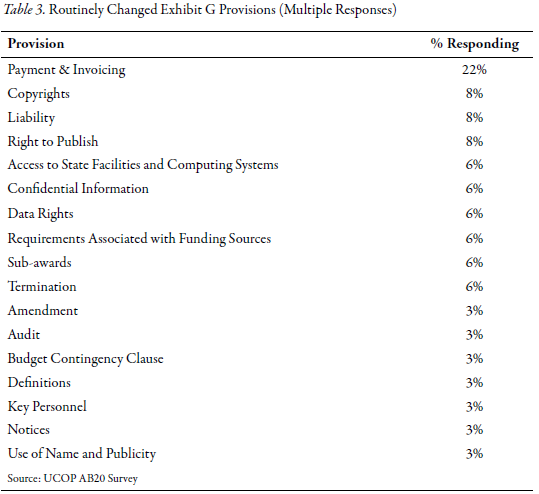 Among these, the inclusion of Exhibit G allowing for alternative model agreement terms was the most prevalent issue, as shown in Table 6. All the faculty respondents reported, with some reservation, that they agreed that the key stakeholders were involved throughout the implementation phases of the AB20 CMA process. Responses from research administration were more mixed, with 29% reporting “Yes” with no reservations and 14% responding “Yes – Somewhat.” Forty-three percent responded “No” to key stakeholder involvement (Figure 4). 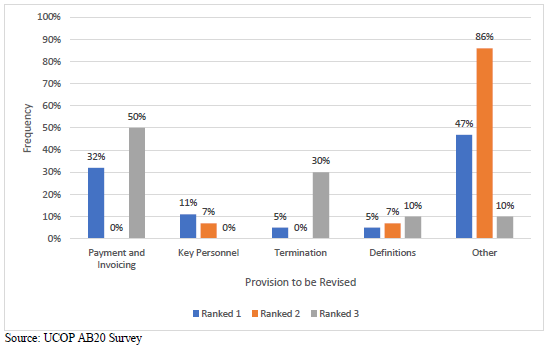 Research administration respondents were evenly split in their consideration that university staff (general) and state agency staff (general) (22% for each) were not engaged in the AB20 CMA process. Just under half the faculty considered state agency staff (general) to be disengaged as presented in Figure 5. In addition, 11% of research administration also considered the University’s intellectual property office to be a key stakeholder that is not currently engaged in the process. Last, 11% of research administration and 22% of faculty reported that they felt all necessary key stakeholders were involved in the AB20 CMA process. 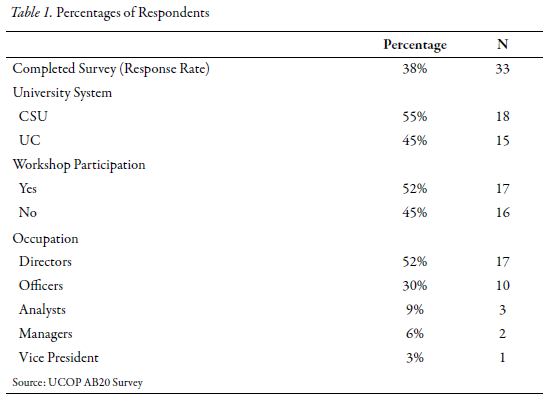 When asked if the participant considered the AB20 CMA process a success, the overall interview responses showed far more research administration respondents considered AB20 to be successful 71% (N=5) than faculty 33% (N=1). When the participants were asked “how they would measure success,” 25% of faculty responses mentioned the decrease in negotiation time as a top measure of AB20 success; both the speed in which awards were processed and consistent award terms tied as a secondary concern at 11%. 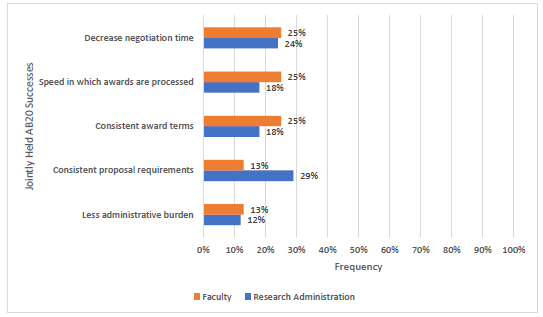 Research administration indicated consistent proposal requirements as the top measure of success (29%) followed by decreased negotiation time (24%; see Figure 6). There were no responses expressed jointly by faculty and research administration on improvement still needed for the AB20 CMA process, with the exception of more education on the AB20 CMA process for both state staff and university staff. Faculty responses were focused evenly on the need for improved turnaround times for executing awards and the need for more education on the proposal and contract process for both state and university staff. There was a broader range of improvement concerns from research administration, as shown in Table 7. Clearer instruction, more budget consistency, less paperwork, and improved communication from key stakeholders were among the higher responses. 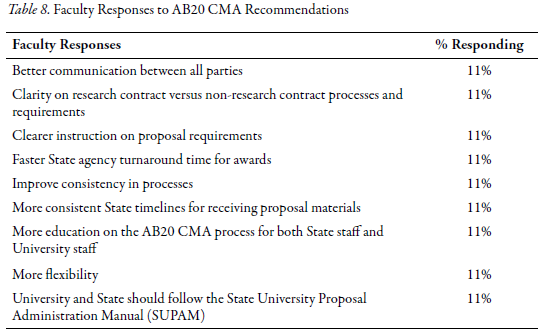 As with AB20 CMA improvements, there was agreement on only one recommendation between the faculty and research administration: More education on the AB20 CMA process for both state staff and university staff. In general, faculty responses consistently called for improved communication; improved clarity and consistency in the delineated processes, deadlines, and timelines; more training/education; and increased flexibility. These faculty responses are presented in Table 8 below. 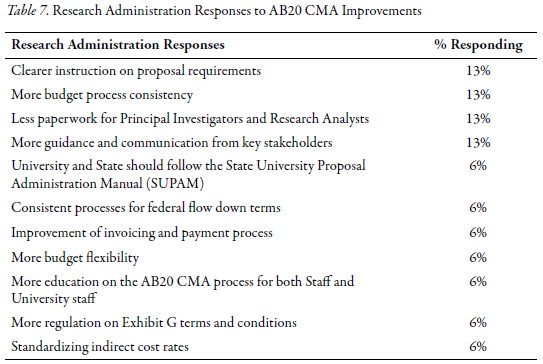 Research Administration recommendations in Table 9 focused on more education on the AB20 CMA process (36%), consistency regarding the framework and processes (18%), and more guidance and communication from key stakeholders (18%). Critical issues since the implementation of AB20 and the CMA centered on education, on its process, and the need for more communication. 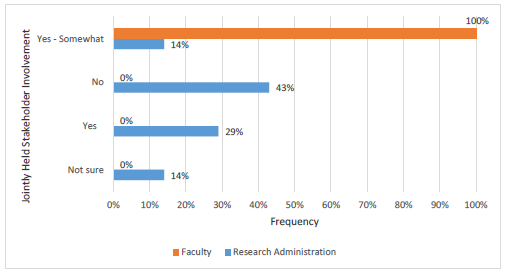 Budget inflexibility concerns have noticeably shifted from faculty to research administration. The latter staff also noted a concern with the use of the Exhibit G alternative model agreement terms and conditions. Stakeholder involvement was a potential source for concern, with 29% of research administration agreeing without reservation that stakeholders are involved, and 100% of faculty saying “Yes” with reservations. This area clearly requires clarification and definition. It would provide an opportunity for a more defined AB20 CMA process that ensures the inclusion of all stakeholders, with the concerns of primarily university staff and state agency staff in mind. The interview data responses regarding the perceived success of AB20 were mixed. Although the majority of research administration agreed that it was successful, faculty largely reported uncertainty. Whereas faculty included decreased negotiation time, consistency of terms, and the increased speed of awards as evidence of success, research administration had mixed responses to these measures. The impetus for developing and implementing the CMA was the mutual discontent of the California state agencies and the UC and CSU university systems with the status quo. Although the CMA is steeped in the philosophy of the Federal Demonstration Partnership— “finding efficient and effective ways to support research by maximizing resources available for research and minimizing administrative costs” (FDP, 2018)—it is a novel framework providing an all-in-one proposal application and award generation approach. The strengths of the CMA are that, if used as intended, the parties are provided “perfect” information at pre- and post-award stages. The expectations of both parties are known upfront and the resulting agreement can be executed without lengthy negotiation times. Additionally, the modular design of the CMA allows for a controlled customization of its parts without disrupting its core concepts. The CMA should not be viewed as a California-only innovation; it stands as a model for addressing common challenges in research administration. Academic institutions recognized as state agencies may be particularly interested in its value as a contracting vehicle. For staff at institutions or agencies interested in exploring the CMA framework, they should weigh whether the potential benefits of using this tool are greater than the time, resources, and costs necessary for its success. In making this determination, one must first identify areas of administrative and financial burden with particular funding agencies or potential contractors; consider current working relationships between these groups; gauge the desire on both sides to streamline and work efficiently; and understand the collective stakeholder efforts and support needed to standardize proposal submissions and to reach agreement on terms and conditions—necessitating infrastructural support through complementary, wide-scale organization change. The author would encourage parties to review the aforementioned publicly available draft SUPAM (to be renamed “California Model Agreement Guide” (“CMA Guide” or “CMAG”) in 2019/2020). (UCOP, 2016a), which is a road map for how the model agreement process should work and can serve as a valuable resource for those considering the CMA’s suitability for their institution or agency. Based on the research results of both study cohorts, the CMA appeared to be functional in standardizing contract terms and conditions. In August 2017, the CMA underwent its first round of revisions and the following terms and conditions were revised: Liability, Subawards, Invoicing and Payment, Definitions, Confidential Information, and Program Income (UCOP, 2017) based on the concerns of the targeted survey respondents and key stakeholders. Education for all parties involved to use the process model more effectively. Increased communication to improve consistency and clarity regarding definitions and processes. Flexibility on all counts for process improvement. Identification of additional key stakeholders (e.g., various state agencies, procurement, business contracts, and information and technology security and privacy officers) not currently involved, and their participation in streamlining processes and decisions. The prospect of future AB20 CMA process improvements rests on its primary purpose of streamlining state contracting with academic institutions and also on the partners’ ability and willingness to identify gaps, deficiencies, and appropriate solutions. It is equally important that the academic institutions continue to evaluate the myriad of activities they perform for or with state agencies. The findings of this study point to the need for further research with the goal of determining if a model agreement would work as a paradigm for other state or non-governmental entities. Current economic benefits in the form of faster proposal review times, decreased negotiation time for individual awards, and efficient agreement processing have been reported from the policymakers at the UC and CSU systems. According to UCOP, the next milestone in the AB20 CMA process is to see equal efficiency in the extramural accounting offices. Periodic benchmarking of successes, challenges, and efficiencies from the viewpoints of both an academic institution and a state agency would provide useful information for the research and research administration community. Early discussions have occurred between UCOP, CSU, and academic institutions in other states (notably Virginia and Maryland) that have shown interest in adopting a model agreement process with their state agencies. 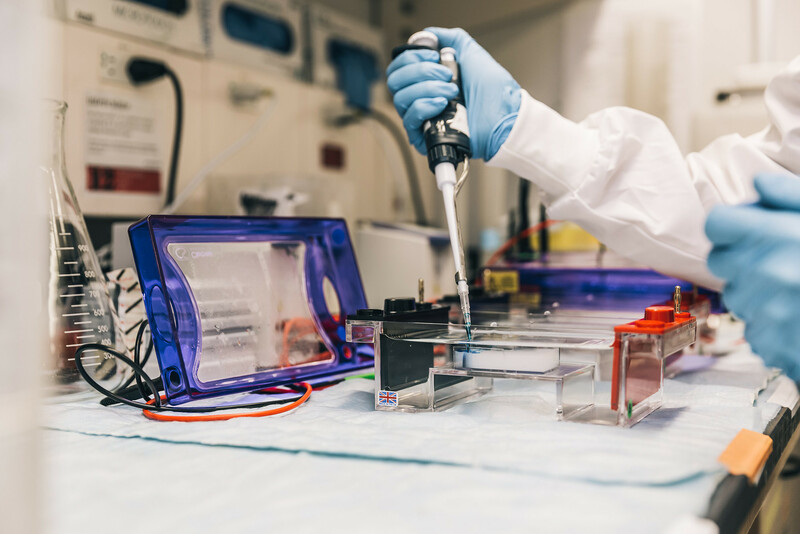 The AB20 CMA process is a fully developed framework that further research could demonstrate is a robust model for other academic/research institutions and other non-governmental entities outside of California. This paper was developed as part of SRAI’s JRA Author Fellowship Program. The author would like to thank Professor Simon Philbin, Director of the Nathu Puri Institute for Engineering & Enterprise at London South Bank University, for his mentorship and guidance. The author would also like to thank the UCOP Research Policy Office and the CSU Chancellors’ Office for providing the author with the 2016 CMA survey data. Assembly Bill No. 20; CHAPTER 402. An act to add Chapter 14.27 (commencing with Section 67325) to Part 40 of Division 5 of Title 3 of the Education Code, relating to public postsecondary education. Approved October 11, 2009. Federal Demonstration Project: Productivity Assessment Task Group. (1991). The impact of the use of expanded authorities within the federal demonstration project. Washington, DC: Government-University-Industry Research Roundtable. Federal Demonstration Project: State-Grantee Relations Task Group. (1990). Report on survey of state requirements applicable to externally funded research activities. Washington, DC: Government-University-Industry Research Roundtable. Gifford, J., & Scanley, A. (1991). Streamlining state agency requirements for grantee institutions. SRA Journal of the Society of Research Administrators, 23(3), 27–32. University of California Office of the President [UCOP]. (2016a). State and university proposal & administration manual: Research and technology transfer memos. University of California Research Policy Analysis and Coordination Guidance Memo 16-01. University of California Office of the President [UCOP]. (2016b). State of California Model Agreement (formerly the AB20 Model Agreement). University of California Research Policy Analysis and Coordination. An alternate provision in Exhibit G must clearly identify whether it is replacing, deleting or modifying a provision of Exhibit C – University Terms and Conditions. The Order of Precedence incorporated in Exhibit C clearly identifies that the provisions on Exhibit G take precedence over those in Exhibit C.
While every effort has been made to keep the UTC as universal in its application as possible, there may be unique projects where a given term in the UTC may be inappropriate or inadequate. California Education Code §67327(b) allows for those terms to be changed, but only through the mutual agreement and negotiation of the State agency and the University campus. If a given term in the UTC is to be changed, the change should not be noted in Exhibit C, but rather noted separately in Exhibit G.
From 1 to 10, (10 being very knowledgeable) rate your level of expertise regarding the AB20 State of California Model Agreement (CMA) process? Describe the challenges of the State to UC proposal (pre-award) and contract (post-award) process prior to the implementation of AB20 and the CMA. Describe the successes of the State to UC proposal (pre-award) and contract (post-award) process prior to the implementation of AB20 and the CMA. From your experience, what are the critical issues since the implementation of the AB20 CMA process? Do you think the key stakeholders were effectively engaged as part of the implementation? Do you consider the AB20 initiative and/or the CMA a success? If so, how would you measure success? How can the AB20 CMA process (pre-award and/or post-award) be improved? Are there any recommendations that you can provide on how state level contracting can be improved?